Nothing like a sticky gooey spicy chocolate nibble! 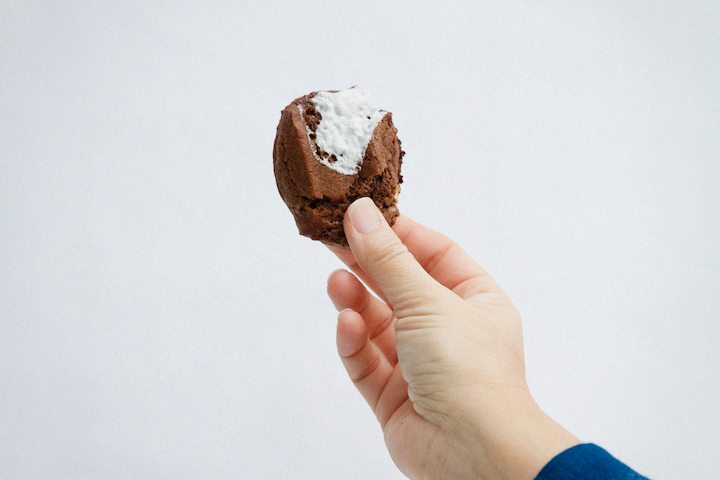 Yousa – these spiced chocolate cookies say ‘lucky’ like nothing else. And as luck would have it, there is one more treat for ‘ya today – a pot of yummy recipes from my favorite Patty girls (and guys) in the blogging world. Enjoy these amazing savory and sweet recipes posted below. I whipped up a double-batch of these cookies – some with that little Aleppo (syrian spice) kick and the other without (for my kiddos). 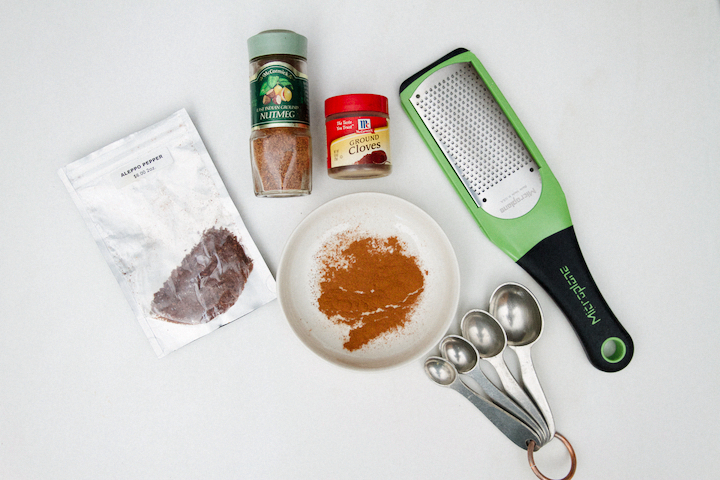 The showstopper spices are nutmeg, cloves, Aleppo, and cinnamon. I chose Aleppo as I how it balances the cookie without overwhelming it. But, you can test out your favorite chili spice to see what works for you. I included a homemade batch of marshmallows, but if you buy the mini-marshmallows at the store, you will not be shortchanged! This spiced dough gets a make-over by adding in chocolate brittle and mini-marshmallows. A super super super easy brittle. It is basically melted chocolate (over a bain marie) with the addition of smoked almonds that hardens at room temperature. 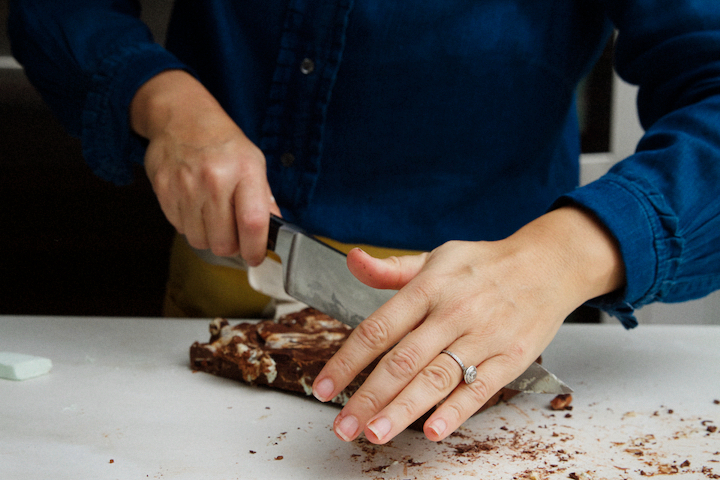 Once it hardens, then you chop it up into small chocolate chunks that will get incorporated into the dough. YUM, right? 2. 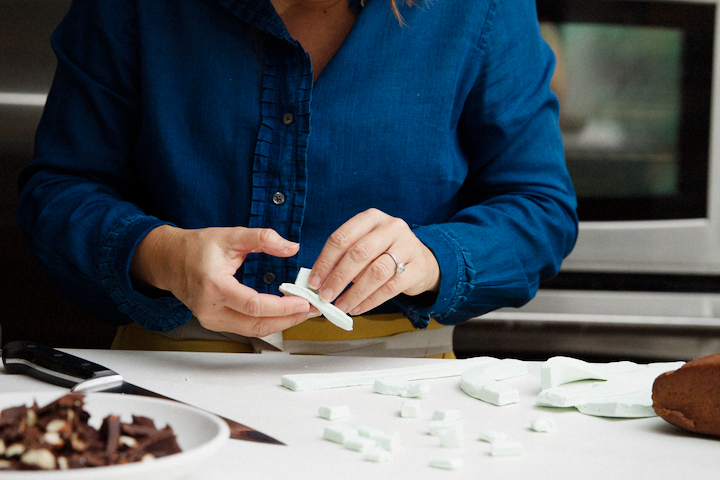 Next, you can incorporate store bought mini marshmallows or make your own. If you make your own, you will want to chop it into bite size pieces to incorporate. 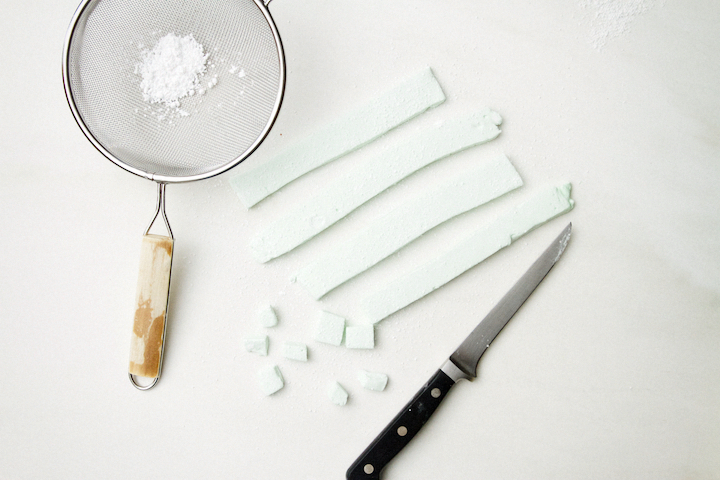 Try this homemade marshmallow recipe if you are feeling adventurous. We recommend freezing them so it is easier to chop! Otherwise, it gets too sticky. I tinted my marshmallows green in honor of St. Patrick’s Day. Now this part is deliciously sticky so prepare yourself. Drum roll… as this is when the dough gets that million dollar makeover. Add in the marshmallows and the chocolate brittle. Whabam! Next step it to mold it into a 12×9 pan, or honestly just anything you have that will allow you to mold it into a square or a rectangle. Pop it into the freezer to chill. Once firm, then remove and slice into 1 or 1.5 inch strips and make bit size cuts. They will spread quite a bit when they bake, and for me they were perfectly imperfect as some were flat and others were a little more rounded. Don’t worry, they all taste the same. Lastly, because I am a total sucker for marshmallow melts, I added one more marshmallow on top so it would get that golden white oozing look while it baked hard onto the cookie. For one batch, I mistakenly forgot to add that pretty marshmallow doo-dad on the top, and so I added it 1/2 way through the cookie baking process and it still came out just perfect. So do what works for you and what sort of rustic aesthetic you love best. Chunky Monkey Chocolate are the words that come to mind with this picture. Let’s amp up the charm in our lives today and feast our eyes on some incredible savory and sweet recipes provided by some fabulous bloggers around the country. 1In a saucepan, melt 5 ounces of the butter over medium-low heat and cook until it has turned golden brown and fragrant like toasted nuts, 5-7 minutes or longer. 2Pour the butter into a heatproof bowl and refrigerate until the butter is solid like shortening at room temperature, approximately 30 minutes. You will be left with 4 ounces of brown butter. 1In a heatproof bowl set over barely simmering water in a pot, melt the chocolate, stirring occasionally with a rubber spatula. 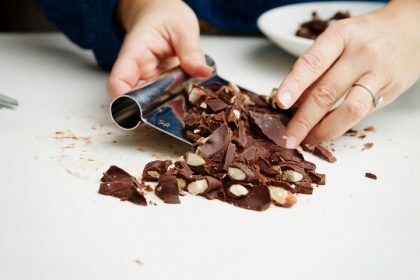 Remove the bowl from the pot and fold the almonds into the chocolate. Pour the chocolate and almonds into the baking pan (prepped with nonstick spray). Refrigerate until firm and set, like a brittle, approximately 30 minutes. Then chop into small bite size pieces. 1If using freshly made marshmallows, put the marshmallows in the freezer until firm, approximately 30 minutes, then chop into small bite size pieces. Or, utilize mini marshmallows. 1Mixer: (paddle attachment) Mix the brown butter and the remaining 4 ounces butter briefly on medium speed for 15 to 20 seconds to combine. Add the sugars and beat until the butter mixture is aerated and pale in color, approximately 4 minutes. 2Add the eggs and vanilla until homogenous. 3In a bowl, whisk together flour, cocoa, baking powder, baking soda, salts, and spices. 4Add the dries to the mixer all at once until it all comes together then remove from mixer and bring together by hand. Do not overmix! Cover with saran wrap and refrigerate until chilled or overnight. 1Meanwhile, take the dough out of the refrigerator and let it come to room temperature. Add the chocolate brittle and marshmallows (frozen if homemade) into the dough. 2Spray an 8-inch square baking pan with cooking spray and line it with plastic wrap, leaving a 4-inch overhang on all sides. 3Transfer the dough to the prepared pan and pat down to flatten into the pan. Fold the overhanging plastic wrap over the dough and refrigerate until set, 1 hour or overnight. 4Heat the oven to 350 degrees F and coat a couple of half sheet pans with cooking spray. 5Remove the set dough from the pan and place on a cutting board. Cut the dough into 1 1/2 inch strips. Then cut each strip into 1/2-inch pieces of dough. 6Evenly space 12 pieces of dough on a prepared sheet pan. Bake for approximately 8 minutes. Rotate the pan and bake until the shape of the pieces has relaxed and the tops look set, approximately 5 to 7 minutes more. Let the cookies cool completely on the sheet pan. Repeat with the remaining dough. 7The cookies can be stored in an airtight container at room temperature for 3 days. Dough can be refrigerated for up to 1 week. OMGee Cindy! These cookies sound like they’re packed with flavor! I’d definitely go for the spicy version! I’ve never tried aleppo, but I’ll need to look next time I go to the market. Love the homemade marshmallow addition too! Thanks MaryAnn. Yes, I am in love with Aleppo Pepper. Glad you liked the marshmallow addition. Where to begin with these cookies Cindy?! Homemade marshmallows, smoked almonds and of course that kick from the Aleppo. I could seriously eat the entire batch. I always have room for chocolate, but this is seriously next level! Awww, so sweet thanks. These cookies are perfectly imperfect. I love the flavors too – thanks for the kind words. So funny. Your last comment made me smile from ear to ear. Misery loves company and I think I have already eaten my weight and then some. These look fantastic. Do you think it would work to try and color store-bought marshmallow green? 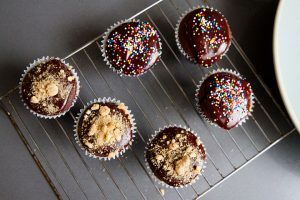 The homemade ones look amazing, but I’m kind of thinking I want to skip straight to the cookies… I love spicy chocolate. Yes, store-bought marshmallows are perfect and they will provide the same gooey texture inside and the perfect crunchy top when they cool. Enjoy! Love the extra marshmallow you added on top! Can never have too much, right? And all those spices (included cayenne?). These sound so good and so much flavour! Plus, they just look like so much fun to make, which is a big part of it 🙂 I’d eat a big ol’ stack of these, even at 10:00 am 😉 Pinned! 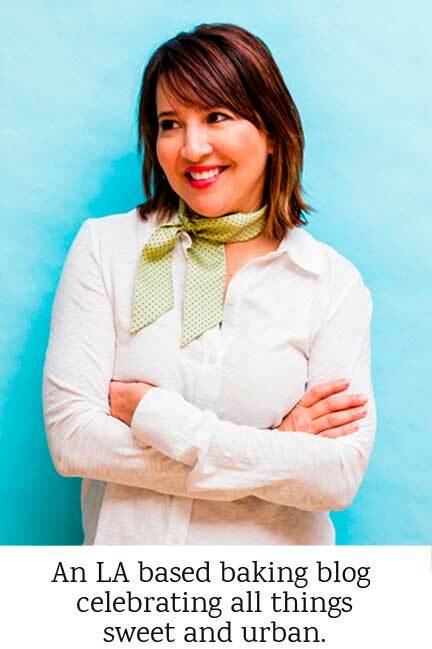 Have a great weekend, Cindy! Thanks Dawn. Yes, this one has some ‘kick’ but it is so well balanced with the gooeyness of the marshmallows and the crunchy tops! Thanks Annie! I saw you were in Cali this week. So awesome – and we had some nice weather. Hope you enjoyed your travels. One day I would love to meet ya, and pass you some of these cookies in person. Ooh, spicy chocolate! Saving this recipe…hubby loves chocolate & spice! These look divine! Luis will love these! Thanks Issa. Yummy! My mom’s birthday just so happens to be coming up and she LOVES Rocky Road anything.. Thanks for the awesome recipe. Happy St. Patricks day!! Oh I am so happy to hear that. I am a sucker for marshmallow and almonds too! If she likes spice, watch out you are going to hit it out of the park! All the spice please! I LOVE spice and chocolate combos! Seriously, though, this cookie is to die for. So many fabulous flavors in one cookie. Pinned for one of my less-disciplined moments 😉 Happy St. Patrick’s Day Cindy! Discipline is overrated! Go for it I say – Thanks Tamara. Still dreamy of your trip coming up! I had some lovely pisco sours rimmed with chile. YUM. Wow these look awesome! I have no idea what Aleppo is. Didn’t Gary Johnson say that too? 🙂 will def check out that spice and try your recipe. Loving your blog! You are too funny. Aleppo is a this beautiful red spice from Syria that has the most delicious peppery taste. You will love it. You are my creative recipe master so add this one to your list. Oh my gosh, I’m loving all the sweet and spice happening in these babies! I’ll take a dozen please. Thanks Karen. Yes, the spice aspect makes this cookie pop in your mouth! Wow theses cookies look insanely good!!! I can’t wait to try this recipe! Thanks Katherine. These cookies are pretty awesome. The kids will love them if you omit the chile part. Thanks! These look absolutely heavenly Cindy and spice and chocolate is one of my very favorite flavor combos. I also love how you make the almond brittle and add that to the cookies. So good!. And the green marshmallows. . .so much fun. Thanks Lynn. This cookie is divine. It hits the right notes! 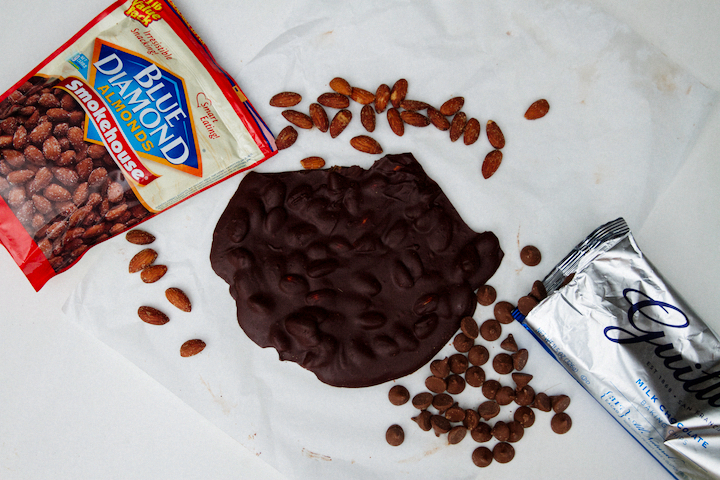 If I were there while you were making these, you wouldn’t be able to finish because I would eat those almonds covered in chocolate before you could do any of the rest! 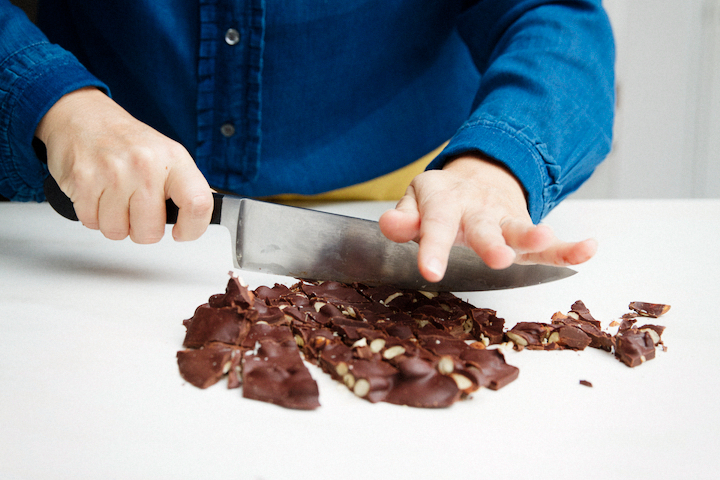 Relees, relees, relees – now now, don’t eat the chocolate brittle before you finish the dough. Please adhere to the recipe! Just kidding. I would stop there too if I didn’t have Maria to stop me. 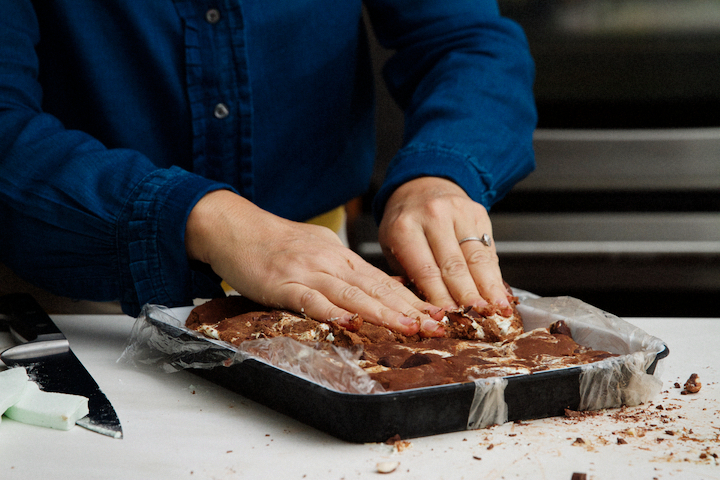 Love this recipe and can’t wait to try it out – chocolate AND marshmallows? I am in heaven (and I think my kiddo will be, too). Loving the posts, everything makes me so hungry! Yes, your little guy will love this. Just skip the chile part and you are golden. 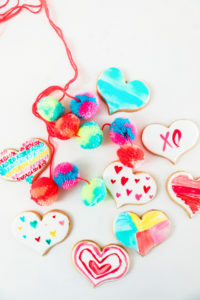 These look like so much fun to make! Mixing the marshmallows into the cookie dough, licking everything off my fingers-SO GOOD! And I love the Aleppo pepper! I would totally hog all of those to myself. Yep, the things that happen behind a camera are top secret (especially that finger lickin stuff). Thanks Meg – I am thinking this needs a boozy caramely drink to boot! Thanks Kevin! 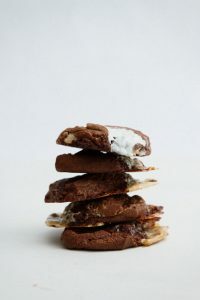 I am a sucker for this rocky-road combination, and well if I find a pot of gold in my pantry I promise I will send you some of the shiny pebbles in appreciation of that awesome Irish potato recipe. Cheers. These look so melt-in-your-mouth delicious that I wish I could reach through my screen and grab one!! Awww shucks, thanks. I wish I lived closer to ya, and I would pass them right along. You had me at homemade marshmellows! and Aleppo! mmmmm mmmmm wow, talk about flavor to die for. These look and sound soooo yummy…. Thanks Mama Myles (love that). I love spice and chocolate – add a little gooey goodness and you are golden. Marshmallows & Chocolate – Match made in sweet heaven! amazing!! Thanks Julia! Appreciate the love. This couldn’t be a better combination of spices. I can’t wait to try this – honestly I’m looking forward to most mixing the whole thing with a bunch of marshmallows and get my hands dirty. The almond brittle is a nice touch! Thanks Ryan. Have to admit, I love the finger lickin mess you will create if you make these with homemade marshmallows. Some messes are the kind you want to dive right into! Almond brittle in cookies? Oh, my!! You have outdone yourself!! YUM!!! Awww thanks so much Stephanie. Appreciate the love. Hope you make them and let us know if you liked them! 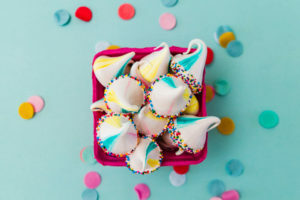 I’m so making these for my kiddos – chocolate and marshmallow!! I think I can manage even the chocolate brittle. Yum! For sure you can master it first time out the gate! Just skip the aleppo pepper and the kids will be happy campers. You are awesome – I love love love your honesty! I hear ya on the overkill of making your own marshmallows. Go straight to the mallow aisle in the supermarket, and you will be loving the recipe all the same. Those look so delicious! I can’t wait until I can’t make them with my little budding 4 year old baker. Double chocolate and marshmallows are an easy sell! Awww, thanks Amber. Looking forward to baking with your little angel one of these days. Holy COW, girlfriend. 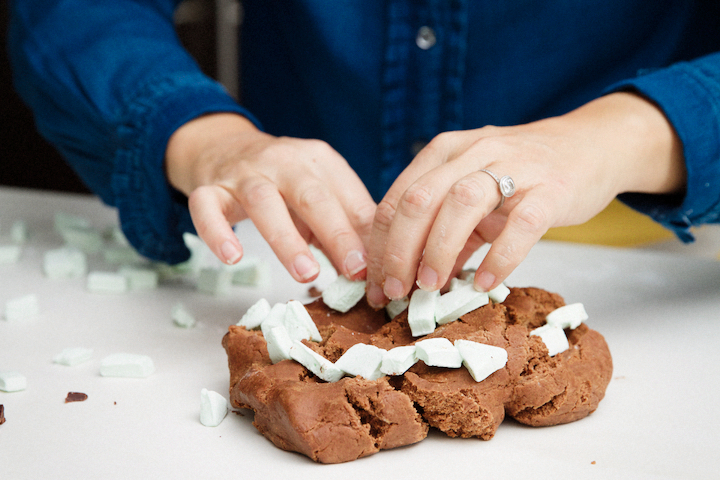 Cookies every day of the week sound like a good idea, but cookies for St. Patrick’s day? That’s a HARD YES! Especially when they are spicy!!! ANNNND filled with brown butter, brittle, marshmallow goodness! YOWZA. It’s been a tough few weeks for me, so I’m going to need about 12 dozen of these babies. I wish we were neighbors because I’d be over trying to trade a cocktail for these! 😉 Cheers, girl! So funny. 12 dozen ‘might’ put me over the edge, but I am willing to try to go down with ya on this one. Hang in there girl. Holy spices! This sounds so amazing and can’t wait to try it out for St. Patty’s Day. Yum! Thanks Lorna. 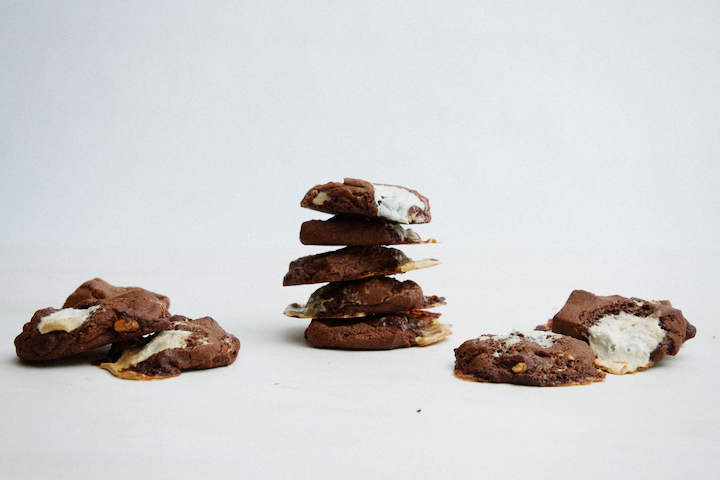 These holy cookies will have your angels singing! Such a cute idea! Looks really yummy! Will have to try! I’m going to have to try this, it sounds amazing!! Thanks Maria! Appreciate the love. Hope you get to try these. So appreciate the love Sandra. 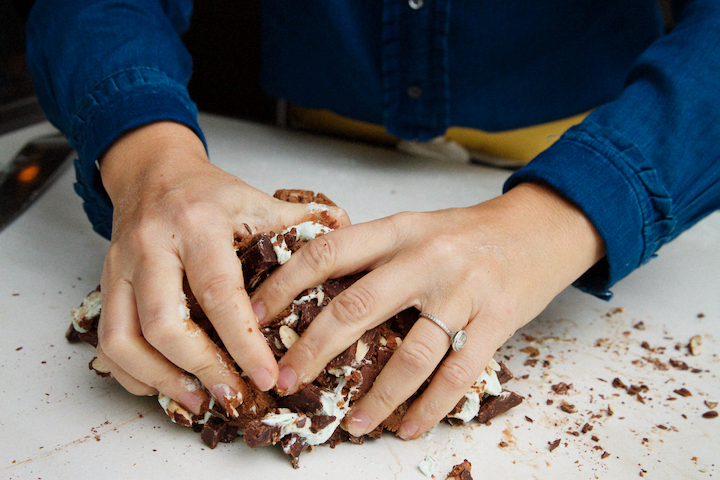 If you like rocky road, you will dig these cookies! YUM. Oh my lord, these cookies look so good I think I’m going to have to dig through my garage to find my mixer. I know the kids will love them so much and my mother in law will think I’m the best just for using this recipe. That is funny. Digging through the garage sounds like a tall order! But, on the other hand pleasing the kiddos and the mother in law might have me dusting it off too! Thanks for the kind words and commenting. Suzzzz! Thanks for commenting. Jadyn is a complete rock star she will be writing my recipes soon enough. 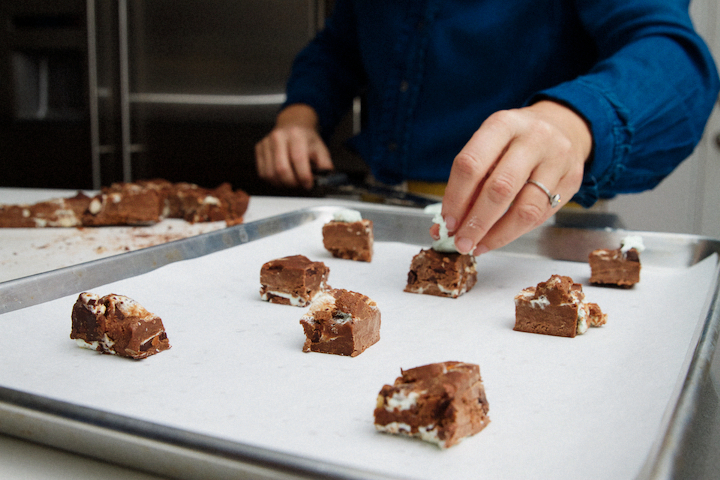 Why don’t you walk on down one weekend and we will have a rocky-road party and make them all together. It would be fun. Thanks Bee! 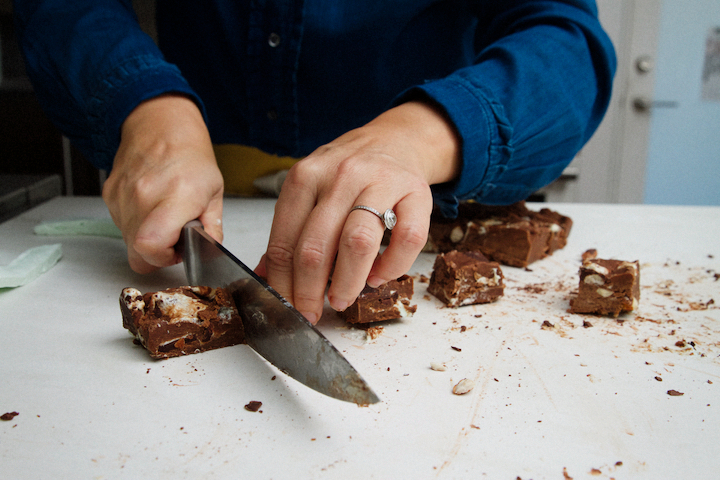 Yes, those boys will love the brown butter, the mini-marshmallows, and the smoked almonds too! This looks amazing!! I love all your recipes because you make them easy to try. My family loves new recipes when it comes from you! These look AMAZING! 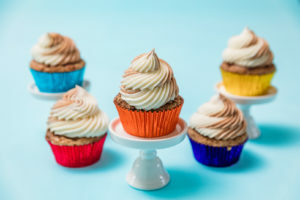 I made the mistake of looking at this recipe when my child was lingering, and now he wants to make them this weekend. I’m guessing ours won’t look as pretty as yours, but they will still be tasty. So funny, I have some dough here at the house – let’s bake them on Sunday! hahaha “chunky monkey”? that sounds about right! Girl these have seriously trying to lick my computer screen! They look seriously delicious!!! Shucks, I think I am the chunky monkey these days after testing this recipe one too many times. (emphasis on test) Thanks for the sweet comment. Yum, yum, yummy! 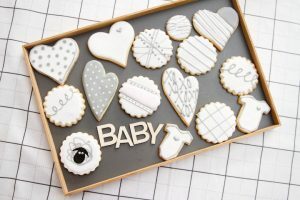 Can’t wait to make these for my family (or really for me!)! Thanks for posting! Wow! These look A-mazing. Can’t wait to try these. I’ll let you know how it goes! What is not to love about chocolate and gooey goodness!!! And then add a little spice and i’m done. 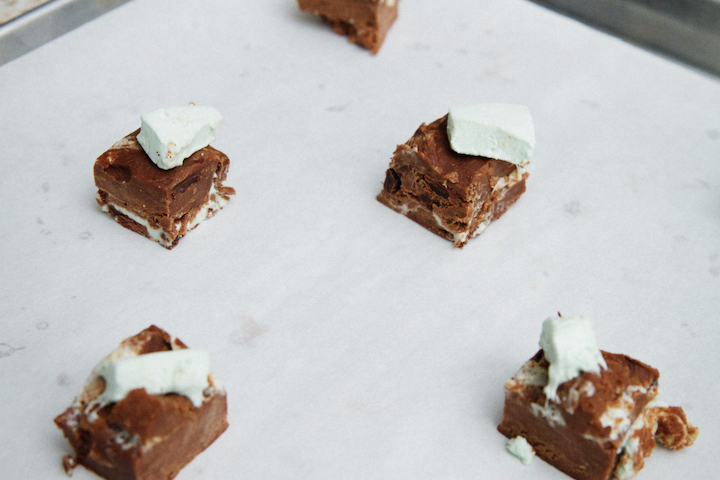 Can’t wait to try these ….. chocolate and marshmallows? And homemade marshmallows? Chocolate brittle? Oh my. Great combo here. I could even make some of this a la carte. … However, i am trying ALL of this yumminess. 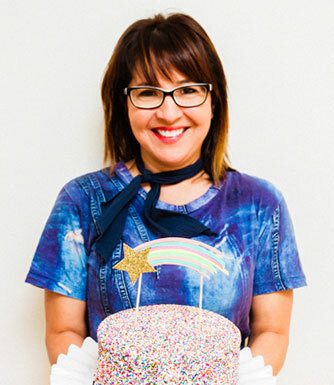 Thank you SweetNerd for your unique eats! Rose Marie, what an awesome compliment. Thanks so much. Your pictures looked uh-may-zing!! 😋😋 Your easy to follow recipes has inspired me to give baking another shot. I’m definately going to try out this recipe (and marshmallows) soon! Thank ya! Appreciate the love. Hope you fall in love with this gooey cookie goddess as much as I have. My goodness! You really know how to make a cookie! I’m in love with that oozing marshmallow! Ooozing marshmallow is right up my alley too! Enjoy Rachelle. I want to eat my screen! These will definitely be a hit at my work on St. Patty’s day, can’t wait to try it! Thanks Evie. Hope your crew loves them as much as I do. These sound gooey and spicy in all the best ways!! Love! Aww, thanks Tessa. The goo + the mallow go perfectly together. Marshmallow and spices in double chocolate cookie!! This is a winner. Thanks so much Jenny. Appreciate the compliment. I am a complete sucker for this rocky road combo. I loove how the marshmallow drapes around the cookies as they bake. They look so delicious! Right? Now, that is what I call a well-dressed cookie. Thanks Giselle.